National HIV Testing Day (NHTD) was first observed on June 27, 1995. NHTD is a day to encourage people to get tested for HIV, know their status, and get linked to care and treatment. The 2018 theme is "Doing It My Way, Testing for HIV". Use the HIV Testing Sites & Care Services Locator. Embed the HIV Testing Sites & Cares Services Locator in your site to connect your audience with HIV testing, housing and mental health services, and more. Get HIV.gov’s NHTD 2018 articles. Follow @HIVgov and use #HIVTestingDay, #NHTD, #DoingItMyWay and #HaciendoloAMiManera. Find free HIV testing at Walgreens stores in over 180 cities June 27, between 10 am – 7 pm (local time). For locations, visit this GTA page. Join this Thunderclap by June 27 at 10:30am (EDT). 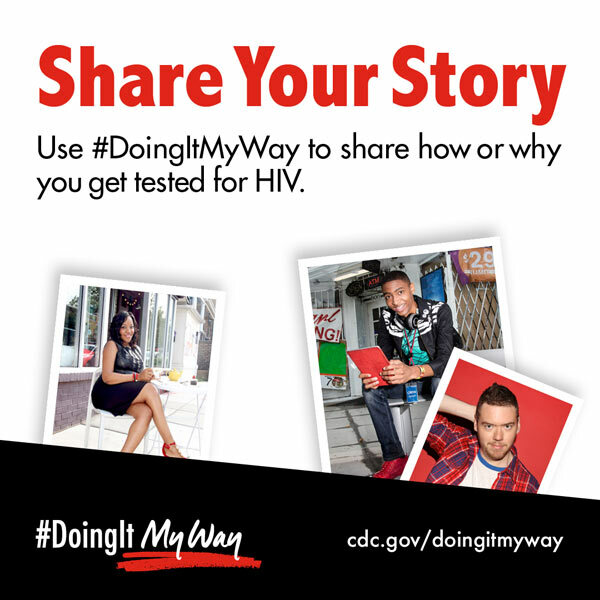 #DoingItMyWay (#HaciendoloAMiManera), is a CDC social media campaign that makes HIV testing personable and relatable by highlighting how and why people make testing part of their lives. Visit the DoingIt site to get the toolkit (PDF 7.6 MB), see the social wall and say why you’re Doingit. 2018 posters, social media images and infographics are now available from CDC. Add the logo to your site and materials. Watch and share the Doing It campaign videos. Positive Spin is a series of real stories from real people about their unique experiences along the HIV Continuum of Care. Watch the trailer. Follow CDC on Instagram. Read the Presidential message. Read this study on intervals between HIV testing and the CDC web feature about NHTD 2018. Check out HIV.gov on Instagram for stories for NHTD and about living with HIV. Get basic information from HIV.gov about HIV prevention, testing and more.